Buying a car seat for your baby can be complicated. On a first glance, not only are there different kinds of car seats, but different kinds of the different kinds of car seats. No wonder it can feel overwhelming! If you have decided to go the route of purchasing a convertible car seat, that is, a car seat that you can use through several stages of your child’s life, we are here to make things a bit easier for you. As with any car seat, you are going to want to make sure that your convertible car seat has a secure five-point harness. The straps should be comfortable for your baby and easy to adjust to ensure a continually proper fit as your child grows. First and foremost on any new parent’s mind is the security of their child. Federal standards dictate that car seats be evaluated for safety at speeds of 30 mph, but some companies will even go above and beyond this. Energy-absorbing foam is a definite added plus to safety features, as it can help absorb an impact and keep the bulk of the force from hitting your young one. A deep shell is also something to look for, as this will help shield your child from any flying debris, should you have a collision. These days, we are lucky enough to know that the longer your child can ride rear-facing, the better. Experts recommend that your toddler ride in this position until age two, or until the maximum height and weight limits have been reached for your particular product. With this in mind, we advise you to pay attention to the maximum rear facing accommodations that each product offers. Don’t feel like you need to sacrifice your baby’s comfort for safety. A good quality convertible car seat will provide the full package. Moreover, because the words “baby” and “mess” are more or less synonymous, you will want that comfy material to be easy to clean. A car that was manufactured after September 1, 2002, will be compatible with a LATCH installation. LATCH, Lower Anchors and Tethers for Children, is an alternative and, some say, easier way to install all car seats. Any convertible car seat manufactured after that date of September 1, 2002, can be installed using LATCH. Alas, a convertible car seat is not a purchase you should make second hand or accept as a hand-me-down. Even a small fender bender can compromise the car seat’s ability to protect your toddler, and an incorrectly stored car seat might be suffering from a breakdown of vital safety components. For your baby’s sake and your peace of mind, invest in a new convertible car seat. As much as companies test and retest their products, a recall is always possible with any product. Be sure to register your new convertible car seat so that you will receive notifications of any future recalls, as well as the actions you need to take to ensure your baby’s continued safety. Parents Central offers a quick way to find out how to register your car seat, so be sure to put this at the top of your to-do list. While the above is certainly plenty to take in, we are here to narrow down your choices. Here are some of our favorite convertible car seats. Unfortunately, convertible car seats are not exactly famous for their ease of installation. Many parents even recommend buying a few convertible car seats if you are going to be regularly alternating between vehicles. Here are our picks for convertible car seats whose installation won’t raise your blood pressure. This car seat is renowned for being easy to install using both the LATCH and traditional seat belt installation methods, a brag not many products can make. The non-rethread harness is adjustable to fourteen different height positions, and the buckle has two positions for your growing baby’s continued comfort and safety. Speaking of safety, this convertible car seat features a steel frame, a deep energy-absorbing shell, and a foam-lined headrest. An integrated slide path makes re-positioning the LATCH strap from rear-facing to forward facing simple, and the seat boasts a unique mechanism with nine different recline positions. This means you can find the perfect angle every time, whether they are ready for sleep, wide awake, or anywhere in between. What’s more, two Ride Right bubble levels will indicate the correct seat angle in both rear facing and forward facing positions, taking the guesswork out of installation. While all of the products reviewed here come highly rated in the safety category, here are a few we felt stood out for their unique features. Britax again makes an appearance on our list with a product that protects children beyond the federal safety standards. An impact absorbing base, steel frame, deep, foam-lined shell, and an energy-absorbing headrest are all designed to protect your baby. 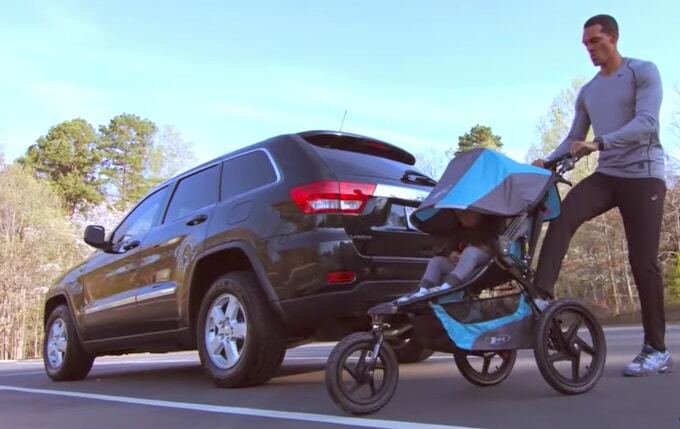 This car seat’s build will also shield your child from any debris that occurs during a collision. Your little one’s delicate head and neck are secure in the comfortable headrest, and the quick-adjust harness has ten positions. An impact-absorbing tether with staged-release stitches will slow and reduce forward movement in the event of a car accident. This car seat is designed to keep your child rear-facing for as long as possible, which is a huge safety perk in and of itself. However, this product didn’t stop there. REACT (Rigid-LATCH Energy Absorbing Crumple Technology) provides a safer forward-facing seat when the time comes to make the switch to that position. Another stand out feature of the Clek Foonf is the specially engineered super fabric it uses. Greenguard certified, the seat protects against stains, moisture, and odor-causing bacteria. So this convertible car seat isn’t just safe in an accident; it’s safer than most against germs as well. Admittedly, convertible car seats are a pricey investment. However, we have found a few models on the lower end of the price range for you to consider. This product meets all federal safety standards, even exceeding them in terms of side-impact protection. The easy to adjust harness features six positions, and the buckle has two positions. An energy absorbing foam liner provides protection and comfort for your child, and an easily removed and machine washable seat pad makes cleaning a breeze. This smart buy will keep your toddler safe with the Side Impact Protection built into the headrest. The harness is adjustable to five heights, and it is FAA certified for air travel. Lightweight and easy to clean, it has a seat pad that comes in a wide array of colors and includes a dishwasher safe cupholder. We always like to find a product that gives you the most bang for your buck. We believe we found just the car seat for an all around good deal. A more affordable alternative to the above reviewed Britax Marathon G4.1 Convertible, this car seat provides safe travels for your little one as they grow. The deep shell comes with SafeCell Complete Side Impact Protection and can help shield your child from flying debris should a collision occur. The five-point harness is tangle free, although you will have to adjust it manually to your preferred height. This car seat allows for three recline positions, so your child can always ride comfortably. Like other Britax products, it is easy to install using both the LATCH and seatbelt methods. When it comes to traveling in cars with children, safety always comes first. Only after this, should you consider size, functionality and style. Choosing a car seat is an important decision that can feel overwhelming. We’re here to help with simple guides, quick reviews and top picks. As always, remember to follow all instructions included with whichever product you buy to ensure a safe installation. Your local pediatrician, fire department, or police department will be happy to assist you should you feel you want a safety expert to make sure your convertible car seat has the perfect fit in your vehicle. Remember, driving isn’t just getting your child from point A to point B, it’s giving them a chance to see the world. Have a great journey, and drive with the same amount of care that you have for your special little passenger.